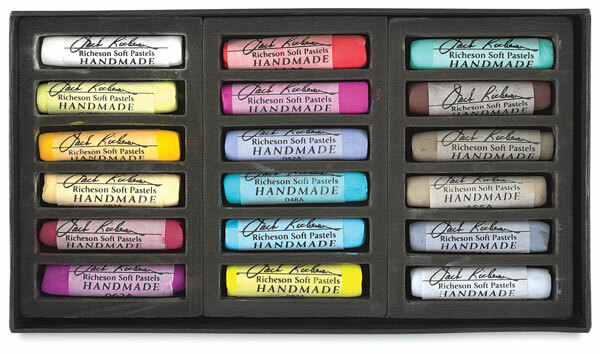 Intended for the professional artist, Richeson Handmade Soft Pastels are 33% larger than most brands, measuring approximately 2-3/4" long x 5/8" in diameter. These hand-rolled pastels have a velvety soft texture, come in a wide range of vibrant colors, and are excellent for layering. 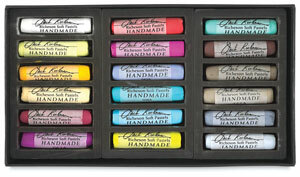 Choose from assorted-color sets — or sets created specifically for portraits and landscapes. Each set is contained in an elegant black box, with each pastel individually cushioned in a foam insert. Note — To see set contents please click the Item Specs tab. Half-Stick Soft Pastel Sets — Now available in a half-stick size, these vibrant, velvety soft pastels are 30% larger than most brands. Hand–rolled for professional artists, each set of Half-Stick Soft Pastels offers an introduction to Richeson's distinctive range of Grays, Earths, Yellows, Blues, and Reds. This set includes Blue 42, Blue 48, Blue 50, Earth 155, Earth 161, Gray 158, Gray 168, Gray 171, Gray 174, Green 31, Green 82, Red 62, Red 114, Red 142, Red 221, Yellow 72, Yellow 83, and Yellow 85. This set includes Blue 42, Blue 48, Blue 50, Blue 51, Blue 57, Blue 59, Blue 65, Earth 89, Earth 91, Earth 99, Earth 116, Earth 150, Earth 151, Earth 155, Earth 161, Earth 237, Gray 158, Gray 168, Gray 171, Gray 174, Gray 181, Green 27, Green 25, Green 31, Green 82, Red 62, Red 63, Red 90, Red 114, Red 137, Red 142, Red 221, Yellow 72, Yellow 76, Yellow 83, and Yellow 85. This set includes Blue 42, Blue 48, Blue 50, Blue 51, Blue 52, Blue 53, Blue 54, Blue 55, Blue 56, Blue 57, Blue 58, Blue 59, Blue 60, Blue 64, Blue 65, Earth 89, Earth 91, Earth 116, Earth 120, Earth 141, Earth 150, Earth 151, Earth 155, Earth 156, Earth 161, Earth 237, Gray 158, Gray 166, Gray 167, Gray 168, Gray 169, Gray 171, Gray 174, Gray 181, Green 2, Green 4, Green 5, Green 14, Green 21, Green 22, Green 23, Green 24, Green 25, Green 26, Green 27, Green 29, Green 31, Green 32, Green 82, Red 62, Red 63, Red 90, Red 114, Red 128, Red 131, Red 135, Red 137, Red 142, Red 221, Red 249, Yellow 68, Yellow 70, Yellow 72, Yellow 73, Yellow 74, Yellow 76, Yellow 83, Yellow 84, Yellow 85, Yellow 87, Yellow 93, and Yellow 95. This set includes Blue 9, Blue 33, Blue 34, Blue 35, Blue 36, Blue 37, Blue 42, Blue 48, Blue 50, Blue 51, Blue 52, Blue 53, Blue 54, Blue 55, Blue 56, Blue 57, Blue 58, Blue 59, Blue 60, Blue 61, Blue 64, Blue 65, Blue 261, Earth 77, Earth 89, Earth 91, Earth 99, Earth 102, Earth 104, Earth 107, Earth 109, Earth 110, Earth 111, Earth 112, Earth 116, Earth 120, Earth 132, Earth 141, Earth 147, Earth 148, Earth 150, Earth 151, Earth 155, Earth 156, Earth 160, Earth 161, Earth 201, Earth 237, Gray 15, Gray 158, Gray 164, Gray 165, Gray 166, Gray 167, Gray 168, Gray 169, Gray 171, Gray 174, Gray 181, Green 1, Green 2, Green 3, Green 4, Green 5, Green 6, Green 7, Green 8, Green 10, Green 11, Green 12, Green 14, Green 21, Green 22, Green 23, Green 24, Green 25, Green 26, Green 27, Green 29, Green 31, Green 32, Green 82, Red 62, Red 63, Red 75, Red 90, Red 113, Red 114, Red 127, Red 128, Red 129, Red 131, Red 134, Red 135, Red 137, Red 142, Red 221, Red 222, Red 249, Yellow 67, Yellow 68, Yellow 69, Yellow 70, Yellow 71, Yellow 72, Yellow 73, Yellow 74, Yellow 76, Yellow 78, Yellow 80, Yellow 83, Yellow 84, Yellow 85, Yellow 87, Yellow 93, Yellow 95, Yellow 105, Yellow 106, Yellow 108, and Yellow 225. This set includes Gray 171, Gray 167, Earth 151, Yellow 73, Blue 34, and Red 131. This set includes Gray 171, Gray 166, Gray 174, Gray 167, Earth 147, Earth 161, Earth 104, Earth 116, Yellow 95, Yellow 73, Yellow 80, Yellow 85, Green 82, Green 11, Blue 33, Blue 34, Blue 58, Blue 59, Blue 261, Blue 61, Red 142, Red 221, Red 62, and Red 131. This set includes Gray 171, Gray 166, Gray 174, Gray 167, Gray 15, Earth 160, Earth 150, Earth 151, Earth 147, Earth 161, Earth 237, Earth 102, Earth 99, Earth 107, Earth 104, Earth 109, Earth 116, Yellow 106, Yellow 93, Yellow 95, Yellow 68, Yellow 83, Yellow 105, Yellow 73, Yellow 80, Yellow 85, Green 82, Green 11, Green 5, Green 7, Green 23, Green 27, Green 31, Blue 33, Blue 54, Blue 34, Blue 58, Blue 59, Blue 261, Blue 61, Red 127, Red 129, Red 142, Red 221, Red 62, Red 135, Red 131 and Red 114. This set includes Gray 171, Gray 164, Gray 168, Gray 165, Gray 166, Gray 169, Gray 174, Gray 167, Gray 181, Gray 158, Gray 15, Earth 160, Earth 155, Earth 156, Earth 150, Earth 151, Earth 132, Earth 120 , Earth 147, Earth 161, Earth 148, Earth 201, Earth 77, Earth 237, Earth 102, Earth 89, Earth 99, Earth 107, Earth 104, Earth 110, Earth 111, Earth 109, Earth 112, Earth 116, Earth 141, Earth 91, Yellow 225, Yellow 106, Yellow 108, Yellow 93, Yellow 95, Yellow 70, Yellow 68, Yellow 83, Yellow 71, Yellow 105, Yellow 72, Yellow 67, Yellow 84, Yellow 73, Yellow 69, Yellow 80, Yellow 76, Yellow 78, Yellow 74, Yellow 87, Yellow 85, Green 82, Green 24, Green 22, Green 11, Green 5, Green 6, Green 21, Green 7, Green 4, Green 3, Green 23, Green 8, Green 1, Green 10, Green 2, Green 29, Green 26, Green 12, Green 14, Green 27, Green 31, Green 32, Green 25, Blue 53, Blue 9, Blue 33, Blue 54, Blue 48, Blue 37, Blue 50, Blue 36, Blue 34, Blue 51, Blue 58, Blue 57, Blue 59, Blue 42, Blue 35, Blue 56, Blue 261, Blue 55, Blue 64, Blue 65, Blue 52, Blue 60, Blue 61, Red 90, Red 127, Red 75, Red 63, Red 128, Red 134, Red 222, Red 249, Red 129, Red 142, Red 221, Red 62, Red 113, Red 135, Red 131, Red 114, and Red 137. This set includes Blue 48, Blue 51, Blue 52, Blue 55, Earth 116, Earth 150, Earth 160, Gray 158, Gray 181, Green 21, Green 24, Green 25, Green 27, Green 31, Green 82, Red 63, Red 90, and Red 137. This set includes Blue 48, Blue 50, Blue 51, Blue 52, Blue 53, Blue 54, Blue 55, Blue 56, Blue 57, Blue 58, Blue 59, Blue 64, Blue 65, Earth 116, Earth 141, Earth 150, Earth 160, Gray 158, Gray 181, Green 14, Green 21, Green 22, Green 24, Green 25, Green 26, Green 27, Green 29, Green 31, Green 82, Red 63, Red 90, Red 135, Red 137, Red 142, Yellow 84, and Yellow 85. This set includes Blue 51, Blue 57, Earth 89, Earth 91, Earth 99, Earth 116, Earth 150, Earth 151, Earth 237, Gray 168, Gray 181, Green 25, Green 27, Red 63, Red 90, Red 137, Yellow 76, and Yellow 83. This set includes Blue 42, Blue 48, Blue 51, Blue 53, Blue 56, Blue 57, Blue 58, Blue 64, Earth 89, Earth, 91, Earth 99, Earth 116, Earth 120, Earth 150, Earth 151, Earth 155, Earth 156, Earth 160, Earth 161, Earth 237, Gray 158, Gray 168, Gray 181, Green 21, Green 22, Green 25, Green 26, Green 27, Green 29, Red 63, Red 90, Red 114, Red 137, Red 142, Yellow 76, and Yellow 83.